This is an incredibly beautiful photograph of a place I used to frequent quite a long time ago now. I'm pleased to see that it has only improved. That water is as exhilarating to swim in as it looks. It's a very different experience, I can tell you, from swimming in a pool. In the hot season, this is where you want to be. 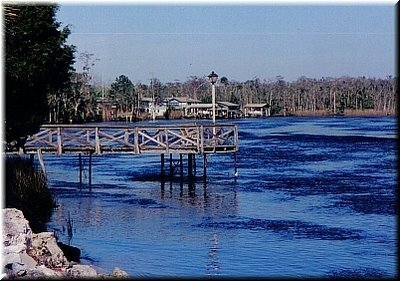 The photographer has a marvelous blog called " Florida Springs" (A blog dedicated to the 700+ springs located throughout Florida and those rivers that are spring-fed.) 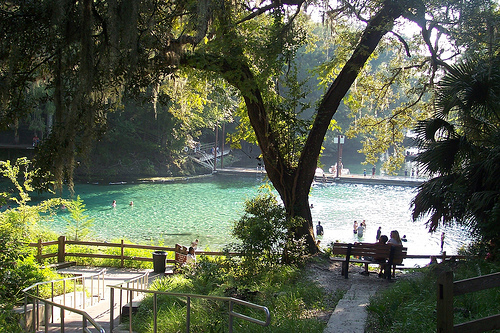 Florida's springs are the true "hidden Florida." I do not own the rights to this Creative Commons photograph, but am using it in compliance with the terms of the license. Please don't save or use it without first consulting the terms of the applicable license (here). Yet another scanned photograph from my private collection: one of my personal favorites. I don't know where this was taken. I say Suwannee, but it's really just a guess. 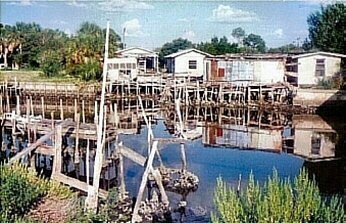 I know it's a canal somewhere in western Florida, but it could have been some other place. I love the untidiness of the reflections due to all the stilts everywhere. It has that bygone feeling you know I love---and from my standpoint, really IS bygone. I love the blue of the water and the greenness and fluffiness of the bush in the right-hand corner. Bonus: There are some lovely photographs of Suwannee here. 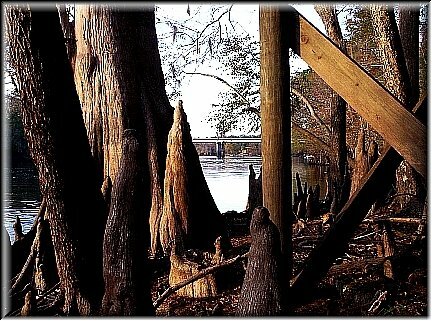 This photograph was taken in or around the small town of Salt Creek at the mouth of the Suwannee. The leaves really don't fall off the trees here in North Florida till just before spring, when the new leaves push off the old leaves. This photograph, taken on the same day and at almost the same time, has a completely different much more wintery feel. You get the winter greys and browns; because of the clouds over that part of the river, you can't see the deep blue of the sky (shown in the river photos above) either in the sky itself or in the river. Again, I love the three dimensional look and feel of this photograph! Somehow getting the edge of the ramp into the photograph (all lighted up by the sun so you can see the wood grain) throws the other things into perspective. I like the tree branch that extends over the river like a piece of decorative iron grillework. The scene is stark but very beautiful.RELATED LINKS In the foreground, there's a stump that looks like a little bearded man with a staff. This photograph was taken by my father-in-law during during our day trip to Fanning Springs and the Suwanee River. The first one illustrates that even in the deeps of our winter (or "winter"), you can always find brilliant greens. 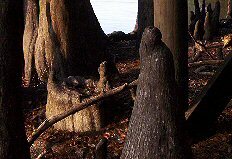 I am sorry that I cannot identify the ferns growing at the base of the cypress knees. I think the green among the trees might be our ubiquitous liveoak, which remains green year-round, but I don't know. 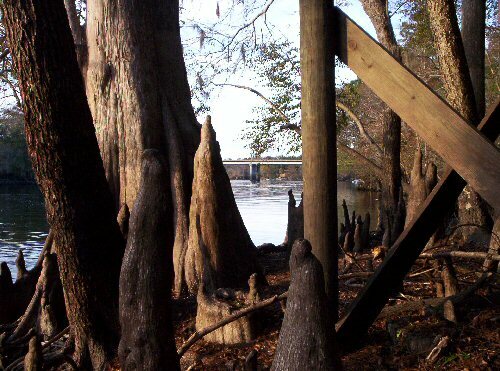 This photograph how weirdly beautiful are the cypress trees (and their knees). I really love the way the light and shadow give depth to the photograph. John (Nick's father) did a wonderful job composing these scenes and he did it with a pretty basic camera (I think probably a Kodak Easyshare). 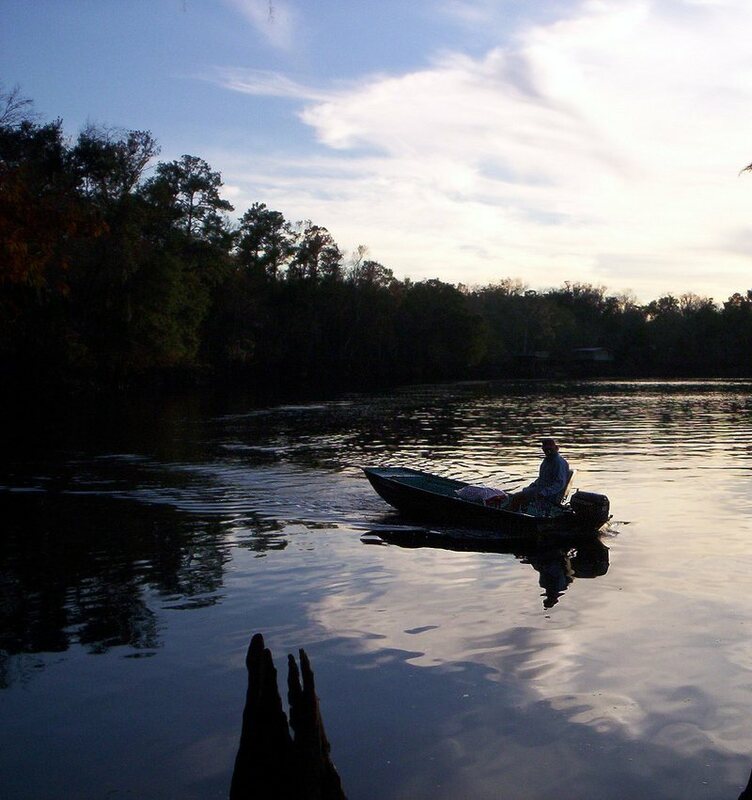 This is another beautiful and evocative late afternoon scene from the Suwannee River in December 2005. In this photograph, my father-in-law perfectly caught that particular tint--periwinkle verging toward indigo---of a Florida winter sky in the late afternoon right before the sun starts to set. While we were standing on the ramp near the riverbank, this boat came puttering down the river. Fishing boats and fishermen are two things that really have NOT changed in my by now surprisingly long lifetime. This man is wearing a blue plaid shirt and a fishing hat, just like all fishermen in all the photos I've ever taken. I love that line of trees along the bank. It reminds me of the writings of Flannery O'Connor; in her stories, a line of trees always represents God. Although she was talking about a middle Georgia pine barren and this is a Florida riverbank, the effect seems the same to me. There is something remote yet familiar about the look of them along this river. The pointy thing in (and on!) the water is a cypress 'knee' and its reflection. It's rather menacing in its pointiness, obtruding into the soft blue of the water. Interestingly, no one really knows the function of the cyrpresses knee. 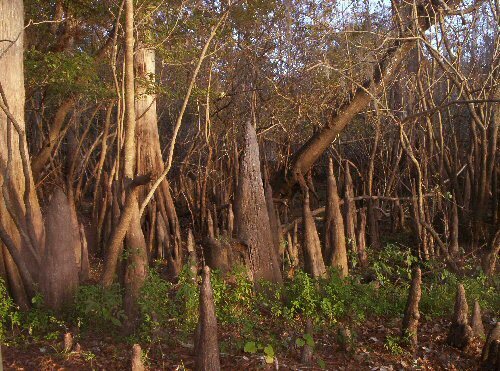 According to the previously linked article, "The knees are part of the tree's root system, but the exact function of the knees is not known. Some scientists have thought they may help in providing oxygen to the tree and assist in anchoring the tree in the soft, muddy soil." The next two photographs show more of these knees.